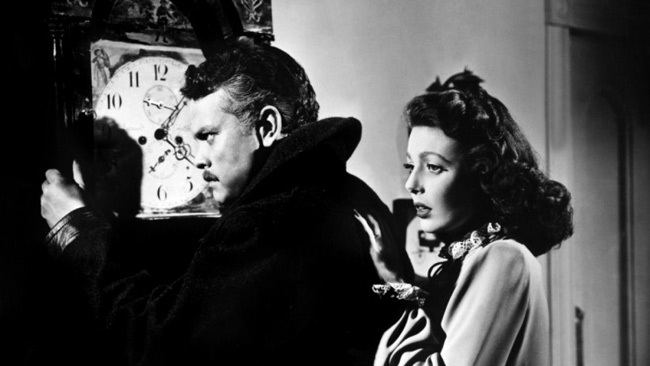 Orson Welles’s 1946 noir thriller classic The Stranger fell into the public domain in the early ‘70s and there’s been no shortage of DVD releases of the film over the past 15 years. I counted no less than two dozen of them available on Amazon—released by suppliers large and small—and I didn’t even make it through the entire listing. Kino’s Blu-ray release of The Stranger—only the second high-definition edition of the film following Film Chest’s edition back in 2011—was mastered in HD from archival 35mm elements from the Library of Congress. And I’m happy to report that it looks like Congress has come through (for a change). Though there are a bunch of visible scratches and lines on the source material, Kino’s edition of The Stranger is the without a doubt the best-looking one I’ve ever seen. From the stark black-and-white contrasts of the interiors of the New England college where a Nazi war criminal (Welles) is hiding out under the new identity of a university professor, to the textured, tree-lined exteriors of the campus, it’s all gorgeous and undoubtedly the most accurate rendition of what Welles and cinematographer Russell Metty had in mind nearly 70 years ago. The Blu-ray include some outstanding bonus features, led by a superb commentary track by filmmaker/film historian Bret Wood, author of the 1990 book Orson Welles: A Bio-Bibliography , a well-researched study that focuses on how Welles’s life and work was interpreted and presented by the media over the years. 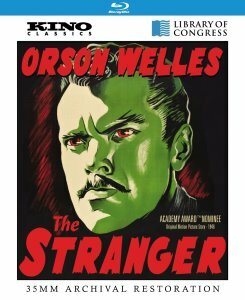 Eschewing the widely held perception that The Stranger is one of the great filmmaker’s most conventional, genre-restrained works, Wood carefully (and confidently) asserts the craftsmanship, vitality and importance of the film in the arc of Welles’ long, often-troubled career. In a scene-by-scene breakdown, he also points out the many examples where studio interference, budget restraints and a short shooting schedule took obvious bites out of director/star/co-writer (uncredited) Welles probable intentions. Also included as a bonus is the disturbingly fascinating Death Mills, a 1945 short informational film on Nazi death camps. Produced by Billy Wilder, it’s comprised of footage of concentration camps shot when the Allies swept in earlier that year and discovered the horrors within. It’s very, very strong stuff and as Welles was known to respect strength—and the power of the filmed image—it’s not surprising that he used some of it in The Stranger.